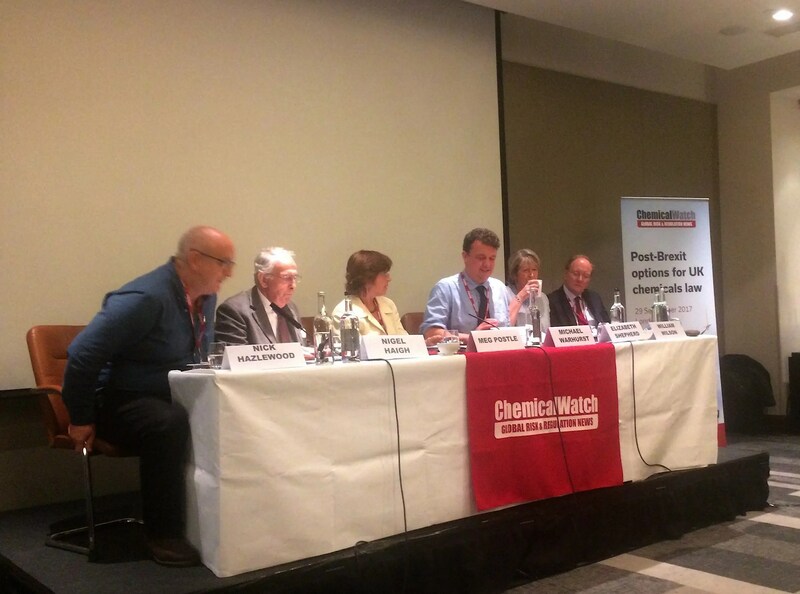 On Friday 29th September, a wide range of stakeholders, including companies, politicians, the UK government and NGOs, gathered to discuss Brexit’s impact on future chemicals regulation in a comprehensive workshop organised by Chemical Watch, in collaboration with CHEM Trust and Tech UK. The overwhelming message of the event was that the UK should aim to stay in the EU’s main chemicals regulation REACH after Brexit, as otherwise supply chains would be disrupted, costs for UK industry would increase and public health and environment quality in the UK would be threatened. In front of a full conference room, the speakers – which included Defra‘s Head of EU Exit for Chemicals and Pesticides, James Dancy, Nigel Haigh from the Institute for European Environmental Policy (IEEP), Mary Creagh MP, Julie Girling MEP, Chemical Industries Association Chief Executive, Steve Elliott and CHEM Trust’s Executive Director, Dr Michael Warhurst, among others – provided an invaluable insight into the post-Brexit options for UK chemicals law. The structure of the event, with several panel discussions, generated stimulating debates, bringing more clarity to a topic which has been handled with a considerable level of ambiguity by the UK government. Andreas Herdina from the European Chemical Agency (ECHA), pointed out that the agency cannot speculate about the outcomes of the negotiations but simply assumes that, as scheduled, the UK will become a third party on 30th March 2019. As their new guidance states, on that date UK authorities will lose access to the ECHA database, the largest one in the world on chemical uses and properties, while UK companies will see their REACH registrations become non-existent unless they have transferred them to another EU or EEA country. A recurrent point shared by most of the speakers, whether they were politicians, representatives of the industry or from the NGO sector, was the importance of maintaining the current standard of environmental protection, and keeping the UK as close as possible to the EU ‘s world-leading chemical regulation, REACH. The representative from Defra told the audience that the UK would adopt a pragmatic approach in order to eliminate distractions for business and consumers. However, there were no details about how this would take place, neither was a clear commitment to keeping the UK in REACH confirmed. The contributions of the two politicians invited to the Conference, Mary Creagh, Labour MP and chair of the Environmental Audit Committee (EAC), as well as Julie Girling, Conservative MEP, member of the the European Parliament’s Committee on Environment, Public Health and Food Safety (ENVI) also added another perspective to the conference. The two political speakers were in agreement about the importance of REACH, the uncertainty that we are facing and some of the problems that would result from the government choosing to create a new regulation system. Mary Creagh MP, reminded the audience about some of the conclusions reached by the Environmental Audit Committee‘s report, “The Future of Chemicals Regulation after the EU Referendum” published earlier this year. One of the concerning issues mentioned was the fact that the creation of a new agency to replace the ECHA would cost 10s of millions of pounds, money that would probably come from tax payers’ pockets. CHEM Trust commented on this report in a previous blog. Jullie Girling MEP pointed out that that the best option for the UK would be to remain a member of the EU chemicals regulation system. However, she acknowledged the current challenge that this option brings up which is the need to keep European Court of Justice (ECJ) jurisprudence, something that seems to be a red line for Theresa May‘s vision of Brexit. However, at the same time the Conservative MEP for the South West of England and Gibraltar emphasised that in any relations we end up having with the EU we would have to have a dispute mechanism. She also called for politicians to stop treating Brexit as a political game and instead as what it seems to be, a national crisis – a remark that many attendees seemed to agree with. He also urged for clarification of the status of existing REACH Registration and Authorisations after 30th March 2019. Michael Warhurst, Executive Director of CHEM Trust, used his talk “Post-Brexit UK chemicals law: The only way is REACH” to point out that in our recent survey nearly two-thirds (63%) of those polled – including 62% of Leave voters – believe that there should be no reduction in regulatory standards that protect people and the environment from potentially harmful chemicals when the UK leaves the EU. CHEM Trust is campaigning to keeping the UK in REACH. A key aspect of this work is to create coalitions of those who have the same aim, whether industry, civil society or politicians. Please contact Andrea Speranza for more information. Chemical Watch have also reported on their conference, and this blog has been linked to by ENDS Europe. Nigel Haigh, Honorary Fellow at IEEP and member of the CHEM Trust Board, has published a blog on his presentation at the Chemical Watch conference. Previous post: What is the will of the UK people on hazardous chemicals?